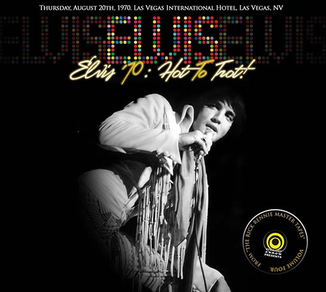 Audience recording recorded in Las Vegas on August 20, 1970 (dinner and midnight show). NOTE. Both shows were released before on the Memory label. For the dinner show see comment at "A Dinner Bell In Vegas", for the midnight show at "A Bright Midnight With Elvis". The 4th volume of Straight Arrow's „FROM THE RICK RENNIE MASTERTAPES“ series - a double-digipak CD release, called "ELVIS ’70: HOT TO TROT! ", featuring the August 20th, 1970 Las Vegas dinner and midnight shows. These recordings, last released in January 2004 by Memory records, have not been reissued since then. To achieve the best possible results, Straight Arrow worked from a direct digital transfer of the original 120 minute cassette. Roughly a week after MGM had left town, Elvis Presley had finally settled on a format for his show that he felt comfortable with and that resonated with his Vegas audiences. He had tried out many different songs during the first two weeks of his engagement: some worked, others didn't. The shows that are included here capture a confident Elvis who at this stage clearly loved performing in Las Vegas. His powerful voice, warm stage personality & cool sense of humor really shine on these recordings, and give the listener a true sense of what it was like to see the man on stage in his prime. Elvis is clearly in his element, singing a well-balanced set that features both the cream of his recent recordings as well as solid versions of his classics. He even jams with the band on brief versions of 'Memphis Tennessee' and 'More'. As with every Straight Arrow’s upgrade, this beautifully designed double-digipack edition is limited to 500 copies. If you enjoyed our previous volumes of the „FROM THE RICK RENNIE MASTER TAPES“ series, you cannot go wrong with " ELVIS ’70: HOT TO TROT!" Ask your local dealer for samples. Newly remastered from the best possible source, these recordings are a real delight for the true Elvis collector!